We went to uncle Derek's house the other day and he made us soup. In front of daddy and me there was a big ceramic plate, a big spoon, a small plastic bowl and a teaspoon. 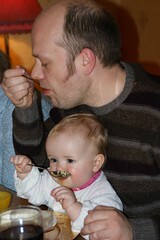 For some very strange reason daddy thought the big spoon and plate were for him. After I had sorted out that misunderstanding, the meal went swimmingly.